I hadn't been to Long's Drugstore since high school! When I walked in it was as though almost nothing had changed. The pharmacy was still on the right hand side of the store. The lunch counter with red leather stools was on the left. The only change that I could spot was the expanded seating area and a few new faces at the grill. They have been in business for almost 55 years. Visiting Long's Drugstore Soda Fountain is like stepping back into the 50's. It's a pretty cool place to be. This was my chance to introduce my daughter and her boyfriend to the Long's Drugstore Soda Fountain. If you are coming from UT campus it's an easy find. Turn left onto Cumberland from the traffic light at volunteer. Go straight and keep going. It's a couple of miles down Kingston Pike. Look for it on the left across from the Ice Chalet. Everything tasted just as I remembered. The milkshakes are still to die for. My daughter's jaw dropped when she saw her huge plate of tater tots covered with chili. It dropped again when she saw her hot dog. It's a good thing that her boyfriend was able to help her out. The rest of the menu includes salads, daily specials, patty melts, burgers, hot dogs and a lot more. The prices resemble a by-gone era. A basic hamburger is only $1.95. The peanut butter and jelly sandwich is less than that. Our visit for 3 of us to the Long's Drugstore Soda Fountain cost only $17 and change. That's comparable to most fast food places and a whole lot more unique. 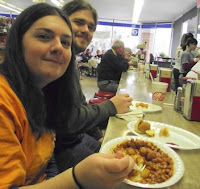 It's safe to say that my daughter and her boyfriend are now hooked on one of the oldest and best places to eat in town.